To the credit of the government, it did make an earnest attempt at genuine progress on the reforms front. Among major reforms, the RERA Act was enacted to regulate real estate transactions, the NCLT initiative has attacked banking NPAs and above all the GST was officially implemented. “Ab ki baar Modi Sarkaar” and the promise of “Achhe Din” were the underlying themes of Narendra Modi’s campaign in 2014. A nation tired of repeated scams and years of inaction on reforms opted for change. The Modi government has just completed 4 years in office and it still has a full year left. The road to 2019 elections may not be as easy as 2014 for the BJP government, as the opposition parties are making a valiant effort to combine their strengths. But to be fair, it is time to look back at the four years of the Modi government. What were the strengths, weaknesses, opportunities and threats? To the credit of the government, it did make an earnest attempt at genuine progress on the reforms front. Among major reforms, the RERA Act was enacted to regulate real estate transactions, the NCLT initiative has attacked banking NPAs and above all the GST was officially implemented. Most of these reforms need a few more years to really fructify and show results. But the process has been set in motion. In the past few years, we have seen the lowest levels of corruption in the functioning of the government. Foreign Direct Investment (FDI) has scaled the level of $60 billion per year and India has become the highest recipient of FDI in the world. Retail inflation, which was at 8.5% when the government took over, is at a more manageable sub-5% level now. All this is reflected in the Nifty and Sensex, which are up 50% in the last 4 years. Forex reserves are also up by 50% since the BJP government took over. So, there surely have been some genuine positives. In some areas, the government has fallen way short of its promises. We are sure that the Rs15 lakh credit into every Indian’s account was more of a metaphor so we are not taking it seriously. But the real shortfall has been in jobs creation. Modi had promised the creation of 1 crore new jobs but at the end of 3 years, the unemployment rate had actually gone up. Law and order continues to be a challenge with Kashmir on the boil and the incidents of religious and ethnic violence on an uptrend. But two things have really hit the common man. When fuel prices were falling, the government sliced away the revenues via 8 excise duty hikes. When Brent Crude is back at $80/bbl, petrol and diesel are at all-time highs. The idea of daily fuel price hikes has not gone down well with people. However, the big challenge is farm distress. The government had promised to double farm incomes by 2022 but most farmers are unable to even realize the MSP (Minimum support price). And farmer suicides have continued unabated despite mega loan waivers. To be fair, some reforms are work in progress and then there is an unfinished agenda. GST has been implanted but it needs to become more growth-accretive. 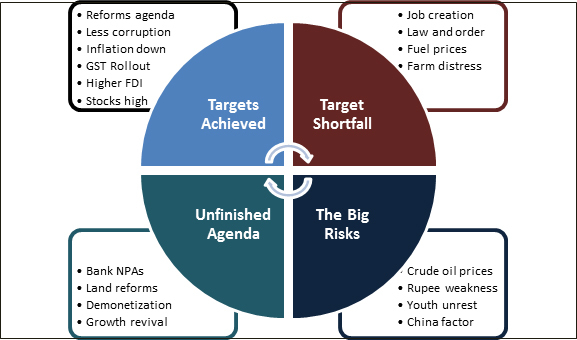 The big challenge is on the NPA front, where the government has bitten the bullet by recognizing the loans and starting the bankruptcy process. But the government needs to show a lot more commitment to chase the compulsive defaulters who have absconded with public money. Land reforms are still an unfinished area and that will give a further boost to infrastructure projects. The government also needs to take the demonetization effort to its logical conclusion by actually attacking the roots of corruption. But above all, the GDP growth has hardly shown promise if you adjust for the change in methodology. That remains the real unfinished agenda. With one year to go for elections, there are four issues that could pose a real challenge. All these are electorally sensitive issues. Firstly, China has been building its influence in the Asian region and another standoff like Doklam could be bad for the government. Crude prices remain the X factor. At $80/bbl, they are already posing a problem. Fuel hikes not only pinch consumers directly but also indirectly via higher CPI inflation. Thirdly, rupee weakness goes against the grain of a government that has painted a macho image in the last 4 years. The INR is close to its all-time low and that is making imports expensive and foreign investors jittery. Finally, the government came to power on the back of youth votes and the same youth is uneasy due to absence of jobs and growth. That could be the biggest challenge for the Modi government in the next one year.